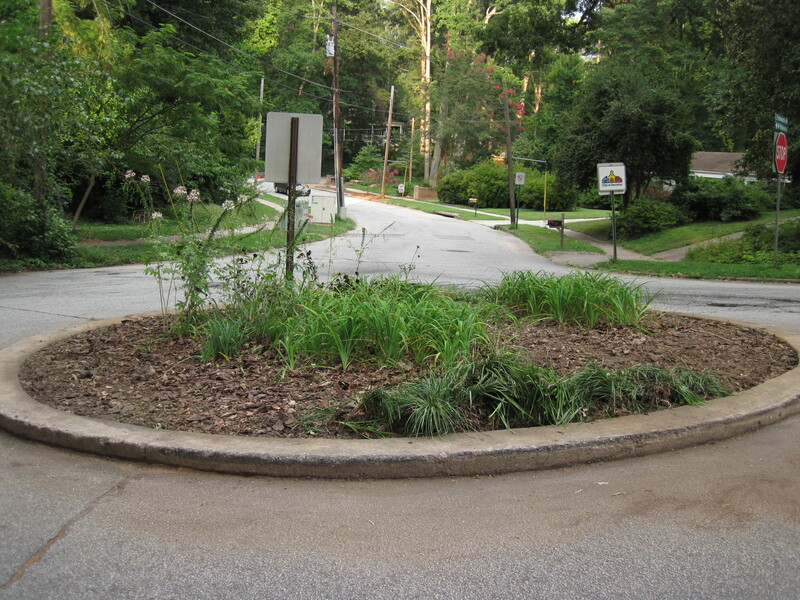 For our workday yesterday, 5 neighbors convened at the East Lake traffic circle and cleaned up the circle by removing a bunch of invasive weeds that had grown up high this summer. We did not remove a few species of cultivated ornamentals that had been purposefully planted there previously. 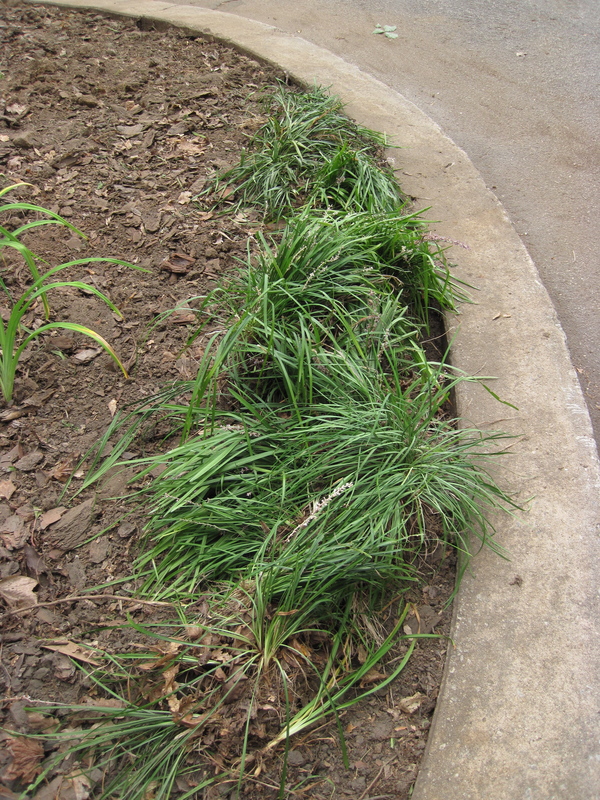 We dug up some monkey grass (Liriope) that we’d like you to please take home with you! It is already dug up and just sitting along the edge of the traffic circle ready for anyone to take home. See photo below. Also, please feel free to dig up and take home as many of the very tall, slender pink and white flowers as you’d like. Their flowers are starting to wither and they are going to seed right now, but it’s still a good time for you to dig them and take them. We don’t know what they’re called, but you can see a photo of them below. Please do NOT dig up any of the other plants in the traffic circle other than this big tall pink flowered-plant. We plan to make the other plants available at a slightly later date, but we’re not ready to have them removed yet. They’re still needed in the circle right now to help control erosion. We’ll let you know when these other plants will be ready for digging. In the meantime you can take the one pictured below, and if you know the name of it, please email me! Please dig up and take home these tall pink flowers! This entry was posted in Alerts, plants. Bookmark the permalink. The tall flowers are cleomes. An annual but they readily re-seed. 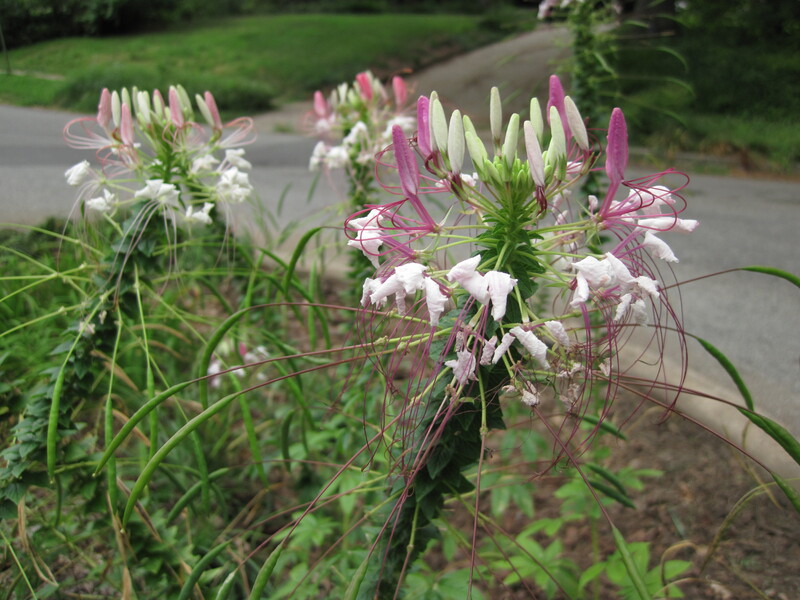 Ellen Powell also says they’re cleome. Thanks for letting us know!